Happy New Year everyone!! Another year! Can you believe it? I still can’t believe how fast time flies, but I’m excited for what 2019 will bring. I hope it’s a great year for us all. I’m sure it will be! The regal dog in my picture is my little dog niece, Jayden. Love her so much! This picture is from Christmas time when I was in New Hampshire. Lots of places for nature walks there. The dogs love it and so do we! I have a cool new book series to tell you all about. Author, Krista Sandor, sent me the first three books from her Langley Park series in exchange for honest reviews. I’ve read the first two, The Road Home and The Sound of Home already and currently reading The Beginning of Home. I’ll save my full thoughts on the series until I’m ready to post my reviews. However, I predict that I’ll be hooked enough to purchase the rest of the series. I still wonder how many books there will be? I could be hooked for life! To learn more about the series, you can head to Krista Sandor’s site at kristasandor.com. They are quick reads, especially the 2nd one, so let me know if any of you start reading. My reviews will be up soon! Update: My review of book one is here. In case you were wondering, the series definitely does not take place in NYC. It takes place in the fictional town, Langley Park, which is in Kansas. You know I would fly to the fictional town if I could! I’d find a town that I’d think was the inspiration for it and explore. Reading the series makes me wish I could do that. Langley Park sounds like it would be a pretty sweet place to explore. However, I can’t get on a plane to Kansas at the moment. This time, I will have to be content with exploring the world of the book from the comfort of my living room, bedroom, and subway train. So yes, this means that this month I will not be doing one of my “book tours.” I’m using this month to read, post my reviews, and also do some long overdue website updates. 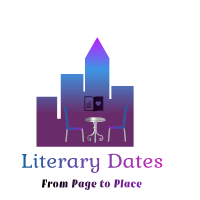 Since I transferred all my posts from my old site to my current “Literary Dates” site, many of my old posts are outdated with my old “Searching for Humor” name including links that lead to that site. Yikes! Also, I got into blogging on an impulse without doing any research(I know! ), so I still have so much to learn. I plan on taking some online courses to improve my skills for you guys. It’s been a fun ride and it’s been great learning all these new skills that blogging has exposed me to. I just want to learn all I can so that my posts can get better and better. I will definitely be doing a tour next month! I’ve got something special planned, which might actually involve getting on a plane. Stay tuned! Thank you all for reading and for your continued support. It means the world to me! Hope you’re having a great start to your new year! This is so cool, Lauren! You’re a real big shot now–authors are sending you books for free for your review?! That’s some pretty badass stuff right there 🙂 You’d better believe that I’ll be sending my book to you when it’s out! Can’t wait to read your reviews! And OMG you’re traveling too? Aaahh that’s going to be so awesome, can’t wait to see what that’s about! Haha! A big shot! That’s funny! Sorry for my delayed response. I worked 12-10pm this week, so couldn’t do much blog stuff. Hi Jayden…I am so sorry that I insulted you and made terrible gender assumptions on IG. I am reformed and paying much better attention these days ; ) You are just so regale and beautiful that I got distracted, hehe. I, too, started blogging before I knew what I was doing. Now I am paying with major clean up! It’s painful. The good thing is that you get established, play around, learn a lot, and then can delete and redirect. Good luck with all of the cleanup as well. I chucked what needed to go, and now I am fixing some old posts. I need wine and pizza. Let me know if you ever have any blogging questions. I am not a pro, but I learned a ton! Hahaha!!! In your defense, Jayden, is a very boyish name. In fact, I don’t know any female Jaydens besides my sweet little dog niece. She does look pretty handsome and regale. Ha! I still have a major cleanup to do! This month has not gone as I had planned. Oops. Maybe I should just delete some old posts? There are some that don’t go at all with my current direction. Hmm? I like your idea of doing the cleanup with wine and pizza! That sounds very motivating! I’m totally stealing that idea. Or were you just thinking about my Friday night TV/Pizza (always with wine) night? You just opened up Pandora’s box because I always have lots of questions. 😬 Thank you so much! You are awesome! Clean up with wine and pizza sounds fantastic to me!! I did mean your Friday tradition, but now you can have a new tradition too!! We can make it OUR tradition lol! I just need to make a gluten-free pizza with lactose-free cheese. We can tweet each other when it’s a date. HAHA.